Isherwood was proud of his great painting signed in a limited edition of Gracie Fields. And he told the story to anyone who would listen that he once met her at the stage door of Wigan’s Hippodrome Theatre. It must have been in the late 40s or early 50s as the place burned down in the middle of the decade. He explained how he has a fascination for painting stars of stage, screen and television, and boasted that his sitters included many familiar faces of the time. One was of Gerry Desmonde who was big in television in those days. Isherwood asked Gracie Fields if she would sit for a formal portrait, but she made the excuse that she was too busy. “Frank Randle sat for me” he told her. But it was no use…the lady wasn’t for artistically turning. 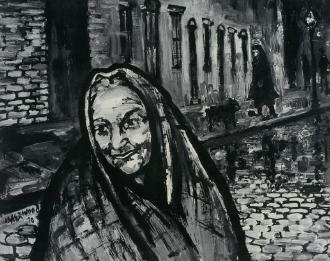 Isherwood did paint a portrait of an old lady – and Gracie signed a limited edition of 75 copies. The edition is thought to have produced by the Whitefield art dealer Henry Donn, who also brought out limited editions signed by Francis Chichester and Field Marshal Montgomery and they were true likenesses. After the shawled old lady had been printed, it was Henry’s job to take them to Capri for signing. Apparently, it wasn’t an easy journey. The prints were bulky and had to be carried in addition to a large suitcase of luggage. It was, to add insult to injury, blisteringly hot. A photo of Mr Donn is thought to have been photographed awkwardly boarding a small craft to ferry him over to Gracie’s home was published by a newspaper at the time. The star herself said: “It looks nothing like me,” but considering it unimportant, signed the prints, accepted her fee and that was that. And so there was always confusion – was it a portrait of Gracie, or a likeness of the old Lancashire women she lauded? The limited edition was produced in a dark hue – and wasn’t particularly popular. Artbyisherwood has finally solved the problem which has bemused Isherwood fans for 30 years. We know the shawled lady in the portrait was a Wiganer and we know the original painting is titled Lancashire Heritage. And while we don’t know her name, we have unearthed photographs of her. She is seen wrapped in a shawl – and you can compare the photos and limited edition here. 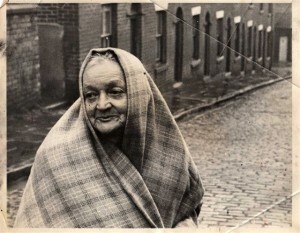 The photograph was taken in 1967 on a street just off Scholes in Wigan and the limited edition was produced by Henry Donn in the early 70s. * If you can identify the lady in the photograph, please contact us.